UND Assistant Vice President for Enrollment Services Sol Jensen gives an audience of staff and faculty a colorful preview of what UND has in mind for a proposed $3 million investment, showcasing why it’s critical that the dollars are spent now. Photo by Shawna Schill. The UND community got a lesson in the recruitment power of branding, web design and digital advertising on Wednesday during the third campus budget forum. UND Provost and Vice President for Academic Affairs Tom DiLorenzo said he’s been fielding several questions about UND’s marketing plan, and his weekly forum offered an effective venue to learn more and discuss the theory behind the plan. Assistant Vice President for Enrollment Services Sol Jensen and his team gave the crowd a colorful preview of what UND has in mind for a proposed $3 million investment, showcasing why it’s critical that the dollars are spent now. 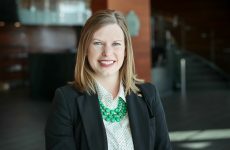 Assistant Professor of Marketing Jennifer Stoner is serving on a working group that has partnered with a hired branding firm to develop a strong branding strategy for UND. That work began with recent focus group discussions and a branding survey that has garnered more than 5,000 responses from the UND community—with the goal of creating a clear message of what UND represents. 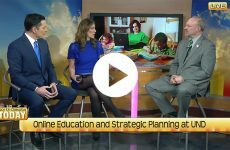 Associate Professor and Chair of the Communication Department Timothy Pasch offered his insights to help build plans for a mobile-friendly UND.edu. 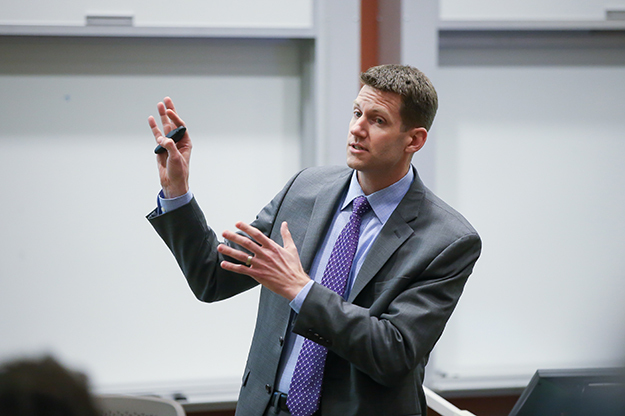 He called upon studies from Pew Research to back the need for a redesign investment. One of the most visually intriguing moments of the forum was the unveiling of one of the first landing page redesigns for Accounting, which features a video banner, clear “call-to-action” buttons and typographic facts that appeal to potential enrollees. Jensen said about 40 pages have been completed with a full website rollout expected in a year. The third leg of the marketing plan will use digital advertising for recruitment. Online retargeting, display ads, social ads and pay-per-click elements will come together as one cohesive strategy. Stoner described the process of advanced targeting, in which messages can be tailored to specific geographic areas, education levels, ages and interests. 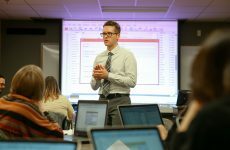 “If we know who is more likely to apply and to accept an offer from UND, we can specifically target those people through digital marketing,” she said. 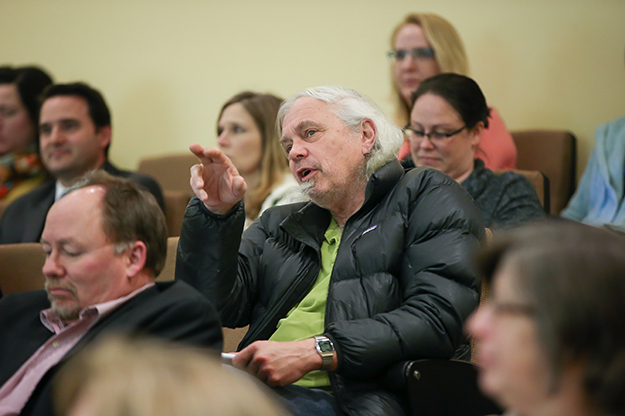 UND Professor of Geology & Geological Engineering Dexter Perkins raised concerns about parts of the marketing plan that call for increased enrollment at a time when faculty numbers are decreasing at UND. Photo by Shawna Schill. Following the presentation, Jensen opened the floor for questions, the first of which came from Director of Women and Gender Studies Rebecca Rozelle-Stone. “Three million dollars has been earmarked for marketing and advertising. Why haven’t we had a precise breakdown of what those costs are going to be?” she asked. Jensen replied that most of the proposed marketing budget would go toward digital advertising, with smaller amounts going toward video content and ongoing website maintenance and updates. DiLorenzo added that the marketing plan is still a work in progress, so exact costs are still fluctuating. Earlier in his presentation, Jensen referenced data from UND’s Office of Institutional Effectiveness that showed how recruiting just 117 more students would create a $3 million return on investment. College of Arts and Sciences Dean Debbie Storrs asked if that number considered UND’s current retention rate, or if that was taking new retention initiatives into account. Jensen confirmed that the numbers showed the current retention rate. “It’s very conservative. We hope to increase that,” he added. DiLorenzo offered an example of how marketing is working with academic units to find that balance. The full marketing presentation can be found on the UND Provost’s website.